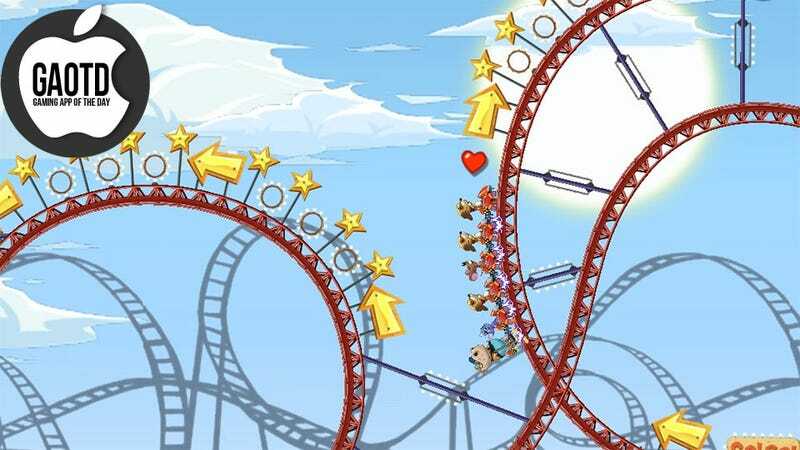 Last week Ubisoft's RedLynx studio released a fun and challenging rollercoaster-based psychics puzzler for iOS. You might have missed it, as the app icon is a cartoon cat and the game is called Nutty Fluffies. I initially passed over the game myself. I couldn't imagine a world in which a game with that moniker would excite me. What the hell does it even mean? What does it have to do with rollercoasters? Once I finally caved and downloaded the app it all made sense. When the fair shuts down for the winter, the stuffed animal prizes come to life and ride the twisting rails. They're the fluffies. The nutty part is that they let folks like me control the coaster. My job is to try and keep the coaster cars from spilling plush passengers while collecting hearts and completing daring acts of aerial acrobatics. I can speed the cars up; I can slow them down. If I do it wrong, everybody dies (they weren't technically alive anyway, so it's okay). Rather than simply unlocking the next level when I complete the previous, Nutty Fluffies transforms the hearts I collect into coins, which must be spent to unlock additional levels. Thing is, those coins are also used to recruit passengers into my rollercoaster. The standard rats are free, but should I want advanced Fluffies that bestow bonuses to my ride, putting powered plushies into each seat cost coins as well, but unlocks the potential to earn more. Some might bemoan this money management layer. I adore it. It gives me something to work towards, along with a bit of strategy, ultimately making for a much more satisfying experience overall. Nutty Fluffies comes highly recommended. Just not by name.